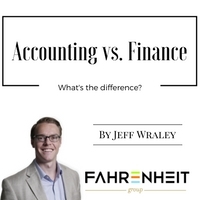 You may hear the words “Accounting” and “Finance” and think they mean the same thing. However, there is a distinction between the two and understanding the difference will help your company to grow and ensure that it has the resources in place to handle this growth. The actions of both the Finance department (finance) and the Accounting department (accounting) focus on a company’s financial statements and everything that contributes to them. Generally speaking, the difference is that accounting focuses on the past and finance focuses on the future. Accounting is responsible for making sure that all financial transactions are entered into the financial system accurately. This includes processing accounts payable and accounts receivable, running payroll, reconciling cash accounts, making any necessary expense accruals, tracking assets and liabilities on the balance sheet, and managing banking relationships. These tasks are performed throughout the month and the books are closed after all entries for that month are complete. All of these actions are performed according to the Generally Accepted Accounting Principles (GAAP), to ensure the consistency and accuracy of internal and external reporting. Finance seeks to understand financial data through the lenses of growth and strategy. This means reporting on and forecasting trends, noting areas of potential financial concern, and working with others in the organization to identify areas for opportunity. Reporting and forecasting is largely centered around financial data, but KPIs and other non-financial metrics can also be used to develop insights. Finance will typically lead the annual budgeting process and will help senior executives make decisions on strategic initiatives, capital investments, and financing. A finance team is made up of individuals who may or may not be CPAs, but that understand GAAP and the accounting function. No matter the size of your company, the line between finance and accounting is never clear cut. An accounting team is likely in place far before a finance resource is added. Many talented accountants and controllers, who would fall into the accounting group on an organizational chart, contribute in much the same way a true finance resource would. However, there comes a time in a small company’s growth cycle where the original accounting team doesn’t serve the expanding needs of the firm. The bandwidth of the existing accounting team (sometimes a single person) is maxed out and the skillset needed isn’t present in the current resources. Investing in current resources to teach them the skills necessary to contribute as the company grows is one option, but the success of that strategy hinges on the aptitude and even the personality of those on an accounting team. As frustrating as it can be for leaders to find themselves without the right resources, many underestimate the amount of time that the resource “mismatch” has been in effect. When an accounting team is asked to perform tasks they may not be suited for, the management team gets poorly informed and inaccurate information. Not a great basis for making decisions. If the “mismatch” has been a long-standing issue, accounting practices will likely need to be revamped and new reporting processes will be implemented. The right resource can drive consistency and efficiency so that leaders can make well-informed and timely decisions. « Sell My Company, Keep My Job…Sounds Like a Great Idea!